Six individual modular panels including a convenient walk through gate, for easy access between the sides. Measures 3.7m (146 in) wide, 74 cm (29 in) tall – giving you flexibility and freedom of 'safe space". Made of a sturdy, yet lightweight metal construction. Simple to construct and install - panels can easily be locked into place - and with its compact design, it folds down for easy storage. Portable and packable to take away with you on your next holiday! So easy to configure to suit individual layouts and needs. The Dreambaby® Royale Converta® 3 in 1 Play-Yard & Wide Barrier Gate is a versatile, convenient and cost-saving method of child proofing. It can be used in multi scenarios and has many uses including as a playpen, a room divider and as a multi-panel gate for large open rooms. At last a child safety solution that caters for contemporary homes and modern living. 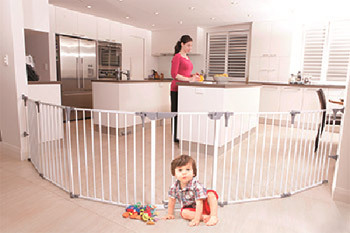 For families with pets, the Dreambaby® Royale Convert® 3 in 1 Play-Yard & Wide Barrier Gate can act as a safe and friendly barrier for your four legged friends, ensuring your living areas are kept safe – for protection and peace of mind. Visit the Dreambaby® web site at www.dreambaby.com.au or call (02) 9386 4000 or in New Zealand call (09) 274 8788.